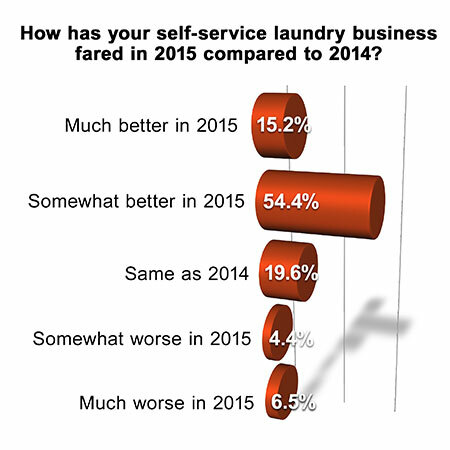 CHICAGO — The majority of coin laundry store owners polled (54.4%) say that overall business was “somewhat better in 2015” compared to 2014, according to results from this month’s American Coin-Op Your Views survey. While 15.2% say their business performed “much better in 2015,” 19.6% say that business this year was the “same as 2014.” Only small percentages reported business being “much worse in 2015” (6.5%) or “somewhat worse in 2015” (4.4%). 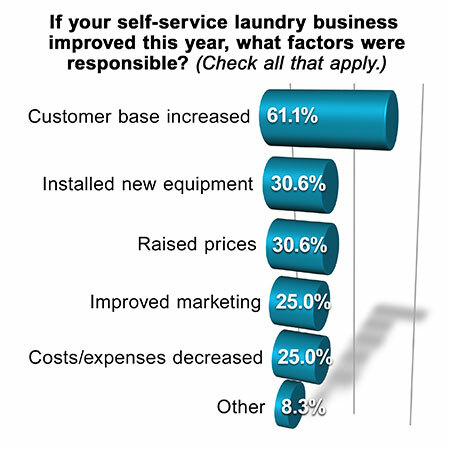 Roughly 8% gave other reasons as to why they believe business improved, such as maintaining good customer relations and a clean store. Some store owners stated other reasons (18.2%) as to why business worsened this year. While the Your Views survey presents a snapshot of readers’ viewpoints at a particular moment, it should not be considered scientific. Subscribers to American Coin-Op’s e-mails are invited to take the industry survey anonymously online each month. Percentages may not add up to 100% due to rounding.